Looking for a low budget way of pursuing your anatomical studies, but finding models and skeletons too expensive? Well, a project by Australian architect and paper artist Horst Kiechle might be right up your alley. 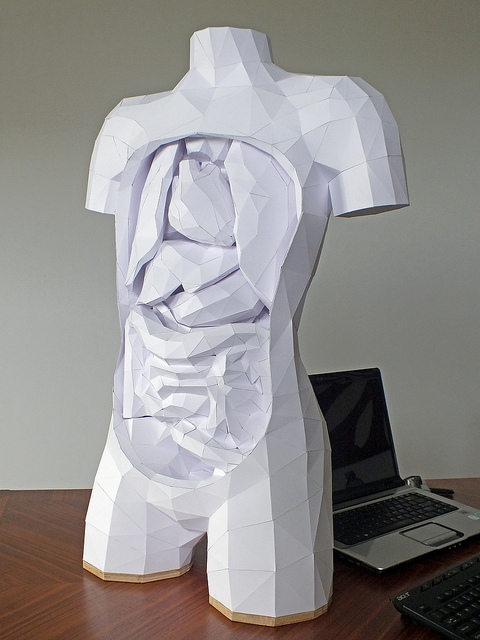 Kiechle recently constructed a complete geometric paper torso, complete with such organs as lungs, intestines, kidneys, pancreas, and stomach for the Science Lab of the International School Nadi, Fiji. Unfortunately, there’s no downloadable template available (at least not yet), but you can see more images of the paper torso and its insides here at Kiechle’s Flikr page.